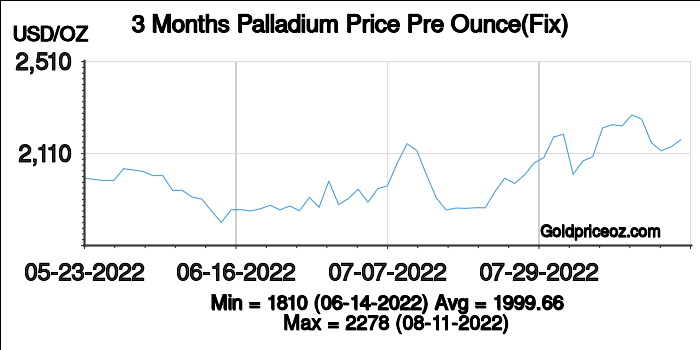 Palladium prices per ounce is a free service provided by Palladium Price OZ website, where shows current palladium price(including bid price and ask price) and palladium price history chart(London palladium fixing). 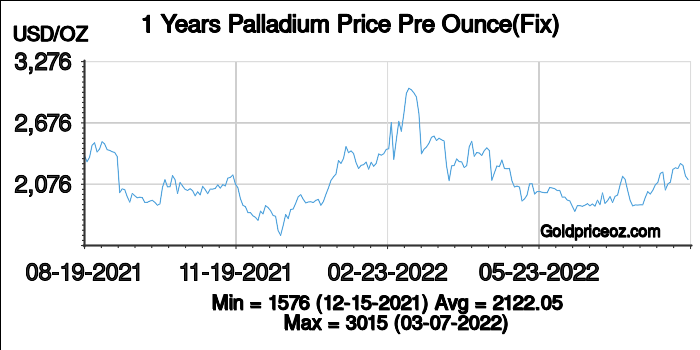 Palladium price per ounce today is being updated once every 1 minutes. 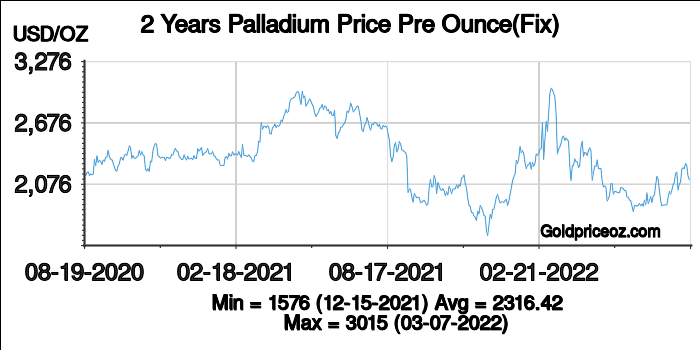 Troy ounce (abbreviated t oz) is a mass unit of troy weight system, is commonly used in measuring palladium and other precious metals. 1 troy ounce is equal to 31.1034768 grams, or 1/12 per troy pound. 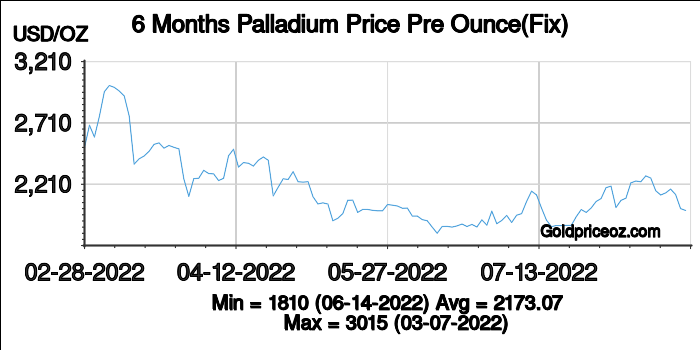 In fact, the London palladium fixing prices are fixed based on the unit of troy ounce; therefore, the palladium prices of this website use the unit of troy ounce. The avoirdupois ounce is commonly used as a unit of mass in the United States. It is defined as 1/16 of an avoirdupois pound, equal to 28.349523125 grams. 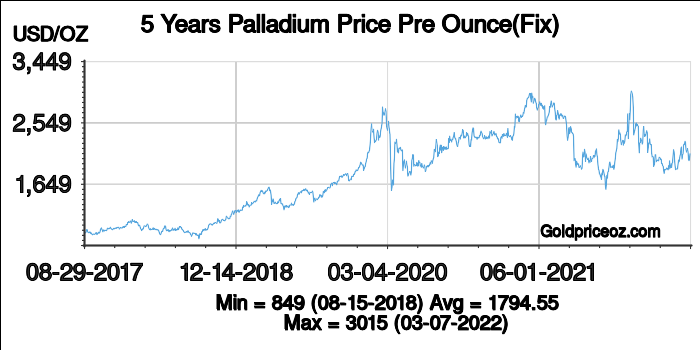 According to convert to gram, it is obviously that the troy ounce is heavier than the avoirdupois ounce, 1 troy ounce = 1.09714286 avoirdupois ounces. In additional, the troy ounce is used for precious metals and gemstones, whereas, the avoirdupois ounce is used in the daily life, rather than for measuring precious metals and gemstones.